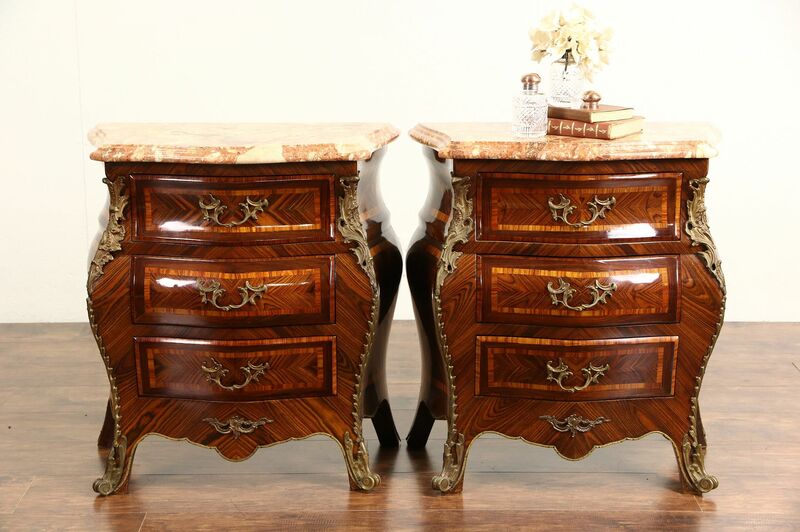 A pair of spectacular Italian small "bombe" convex chests or nightstands from the 1940's are inlaid marquetry of genuine rosewood and tulipwood. The gleaming original finish is in very fine condition with minor mars, see photos. Famous "Brescia" marble shaped tops have been polished and sealed to resist stains. Patinated brass mounts and pulls are original on this palatial vintage furniture. Drawers have dovetailed joints and silk linings. Size is 25" wide, 15" deep and 27 1/2" tall. The matching chest in photos is sold separately, call or email for availability.